Few in the realm of motorsports will deny that one of the most capable drivers to climb behind the wheel of a race car is Mr. Sam Posey. Sam’s driving career started in the mid-1960s, when sports car racing in North America was building at a rapid pace. Daytona, 1966, marked the first, true international debut for this young driver. It was driving a Porsche 904 GTS along with Jim Haynes and Harry Theodoracopulos, that Posey made his entrance onto the international stage of motor racing. The trio faired well that year, starting 22nd and coming home 11th overall and 4th in class at the annual Florida classic. Posey landed a drive at Le Mans that year driving a Bizzarini GT Strada. The effort resulted in a DNF due to a crossing of the pit safety line, but provided him with vital experience that would see him return to the historic French event nine more times. Once back on his home soil, Sam went to drive for Ray Caldwell’s Autodynamics team in a recently announced series that was gaining popularity hand over fist, the Canadian-American Challenge Cup or Can-Am. It was at St. Jovite, Canada on September 11, 1966; the day of the first race in the Can-Am series’ inaugural year, that saw Posey on the grid in 17th position piloting a McLaren M1B. He would finish 21st that weekend and would go onto drive a variety of machines in the Can-Am series, including the Caldwell D7, Lola T160, and the incredible Ferrari 712M. It was in the latter that one of Posey’s most memorable, and perhaps painful, moments occurred. While in practice for the 1974 Watkins Glen Can Am race, Posey jumped on the brakes of Ferrari’s most powerful sports car ever constructed up to that time, when suddenly, the pedal fell to the floor sharply and he ended up braking a bone in his foot, rendering him unable to continue driving the massive red machine from Maranello and turning over the piloting duties to Brian Redman for the race. One of Sam’s more pleasant Can-Am memories was in the 1968 Las Vegas race while piloting a Lola T160. Sam gridded the car 5th behind Bruce McLaren, Denny Hulme, Jim Hall and his Chaparral 2G, and Mark Donohue in an older McLaren M6B. In a race which saw complete carnage unfold in the first turn with Hall and Andretti colliding and the remainder of the field getting lost in the dust cloud that followed the incident; Posey was able to come home fifth in a car that he personally commented to the author was his favorite Can-Am car to drive. The summer of 1969 saw Posey return to the French country side to contest the annual 24 hour endurance classic at Le Mans. He would be driving for Luigi Chinetti’s N.A.R.T. (North American Race Team) piloting a Ferrari 250LM and placing fourth in class, 8th overall. Mr. Chinetti was pleased with Posey’s driving and invited him to return to the 1970 running of the race, this time piloting a Ferrari 512S alongside fellow American Ronnie Bucknum. The pairing was good for a 4th overall, 3rd in class that summer, and was the precursor to an even better result the following year. 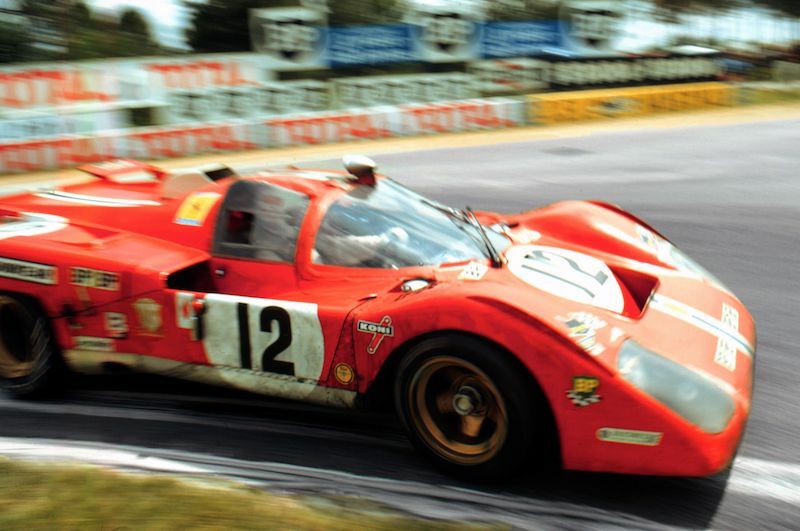 Tony Adamowicz would be Posey’s co-driver for the 1971 24 Hours of Le Mans and the duo, both originally from New York, would be piloting Ferrari’s newest anti-917 weapon, the formidable 512M. Again, the pairing of drivers could not have been more perfect, and the duo was able to pull off a podium 3rd place finish behind two Porsche 917Ks. 1972 would see the pair arrive again in France at the wheel of a Ferrari 365GTB/4 in which they would achieve a sixth place finish after starting 22nd on the grid. Throughout the late 1960s and early 1970s, Sam raced in many different series; including F1, USAC, NASCAR, and a brilliant stint in Trans-Am driving the Dodge Challenger during the 1970 season. 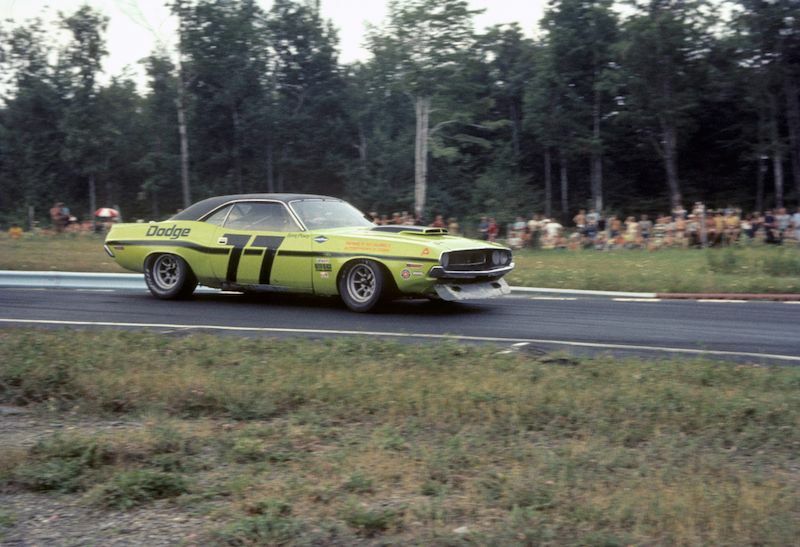 Driving the bright green number 77 Dodge Challenger, Sam finished 3rd at Lime Rock, Road America, and Kent during what most motorsport historians revere as the golden season of road racing. However, it was in F5000, a series that began life in 1968 as Formula A within the ranks of the SCCA, which Sam became a force to be reckoned with. F5000 was an open-wheeled series developed in the United States by the SCCA in which competitors raced open wheeled machines powered by “stock” block American V8 engines capped at 5000cc of displacement. Sam raced the series in 1969 driving a Chevrolet-powered Eagle and finishing the season 3rd in the championship. The 1970 season saw Sam dedicate his efforts to driving in the Trans-Am Series. 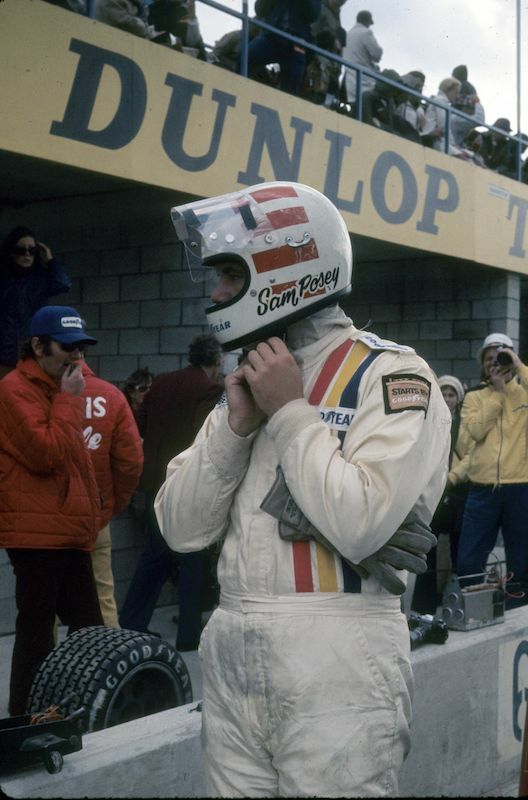 For 1971, Sam returned to F5000 driving a Surtees TS8 and captured front row starting positions in all eight United States F5000 races that year. Sam ultimately finished the 1971 season second, with David Hobbs of England taking the title in a McLaren M10B. The 1972 season also saw Sam at the top of the grid for the U.S. F5000 series piloting a Surtees TS 11. Sam ultimately finished runner up again, this time to Graham McRae’s GM1. Sam went down under in 1973 and competed in the Tasman F5000 series which again he excelled at, finishing second at Teretonga, New Zealand. Sam’s career began to slow down in the mid-1970s after a very busy decade of motor racing that took Sam across the world and back again. 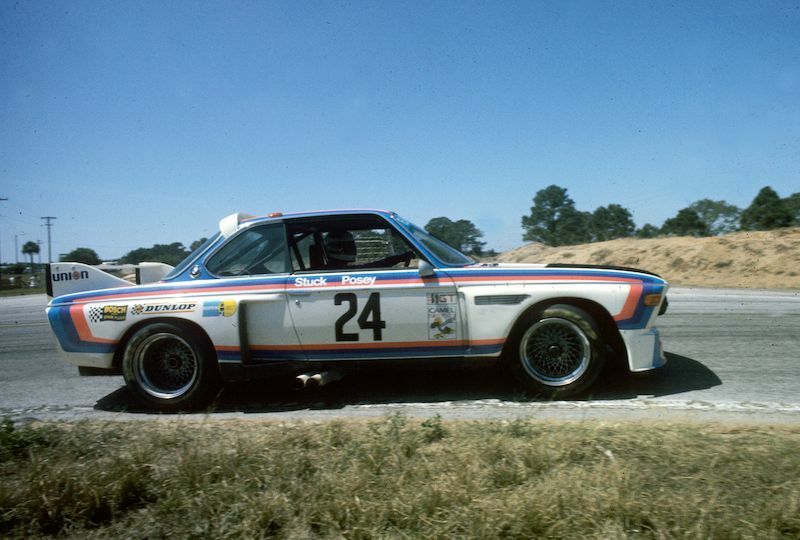 In 1975, Sam was recruited by the factory BMW squad to campaign the BMW 3.0 CSL coupes. This resulted in Sam, along with co-drivers Brian Redman, Allan Moffat, and Hans-Joachim Stuck winning the 1975 12 Hours of Sebring race. In 1978, he made his last appearance as a driver at Le Mans piloting a Mirage M9 and scored a 10th place finish on his final outing. Since retiring as a driver, Sam has never been far from the field of motorsports. He began doing TV commentary for ABC Sports, covering some of the biggest races, including the Indy 500. Later in the 1990s, Sam would work for Speed TV and provide commentary coverage of Formula One races. He continues to write for Road & Track Magazine, as well as authoring two books; “Playing with Trains”, a book on the model rail road hobby, and “The Mudge Pond Express”, his autobiography. He is also an accomplished artist, painting in the abstract. So it was with little surprise that the F5000 Drivers Association elected to give Sam their 2010 Lifetime Achievement Award. F5000 has seen quite a revival in recent years amongst the vintage racing crowd. Grids featuring the F5000 Drivers Association have seen phenomenal turn outs at vintage racing events over the last three years, largely due to the leadership of Seb Coppola, President of the F5000 Drivers Association. In the three years that has seen this classic formula revived, five individuals have received the Association’s most prestigious honor. The Association elected to give Sam Posey the award for 2010 during their annual visit to Watkins Glen, New York. The F5000 Drivers Association departed for the Glen Motor Inn after a very hot and humid qualifying session that took place at the track for the inaugural Legends of Motorsport event. Once all had arrived at the Inn, a dinner was held to award Sam Posey with a lifetime achievement award for his accomplishments both on the track, and off the track as a writer and commentator. F5000 drivers and friends enjoyed a fine meal and some great stories. Seb Coppola stated, “Sam is an iconic figure in motorsports. His contributions to Formula 5000 and other racing series during the 1970s, and still today in sports broadcasting have been enormous. We are proud to present this Lifetime Achievement Award to Sam for his many contributions to the heritage of motorsports.” A standing ovation then took place. Once the crowd of F5000 family members quieted, Sam said, “It’s ironic….No, it’s perfect; that in the background coverage of the Le Mans 24 Hour Race is playing and I’m here tonight with Tony Adamowicz, who co-drove a Ferrari 512M with me this very weekend 39 years ago in France.” Sam went on to comment on memorable points throughout his time in F5000 and even took a few questions from the audience that night. It is without doubt, that Sam has surely led an incredible life; one filled with achievements, both on and off the track. Great memories. I started ‘seriously’ following racing in 1968 as a twelve year old. I focused on any kind of racing out there but I loved the Can-Am cars and the great racing in the Trans-Am series. Right now, over my desk is Pete Lyons’ Road & Track calendar, displaying September with a photo of ‘Road America, July 19, 1970’, where George Follmer and Parnelli Jones lead the field to the start. Sam is a big part of why I enjoyed the Trans-Am so much because a talented driver provided an intelligent perspective through his ability as a writer. I vividly remember his account of racing with Peter Revson in a Javelin at Riverside, and colliding. Sam owned up to the incident and tried apologizing to Peter during the race but Peter was focused, with Sam writing, ‘Peter’s face was a mask of concentration’; after the race, it was a different matter with Peter coming after Sam to vent his fury. Meanwhile, over in F5000…this was another interesting and exciting series involving some great names and teams…including Sam Posey. I could go on, of course…. Congratulations to Sam, a deserving driver and renaissance man. Thanks for posting the story. Sam Posey? Race driver? Did he ever win any race? Joke!